Hundreds of thousands of students in England, Wales and Northern Ireland received their A-levels and AS-levels results on Thursday. More university places are on offer this year, but the numbers are capped and universities face fines if they breach these limits. Yesterday, we discussed the new A* grade, introduced this year to help universities differentiate between the very best candidates. To get the new grade, a student has to score an A overall, plus at least 90% in each paper in the second year of the course. Yesterday, we reported that about 8% of all students’ papers have been given an A*. A total of 8.3% of A-levels taken by girls were awarded the new A* grade, compared with 7.9% of those from boys. Students from independent schools were proportionately more likely to get an A*. They provided 30% of all A* grades awarded, despite making up only 14% of entries. Candidates from comprehensive schools, which are responsible for 43% of A-level entries, gained 30% of the A* grades awarded. Further education and sixth-form colleges, which enter 30% of candidates, saw their students given 20% of all A*s awarded. We are pleased to say that the highest percentage of A*s was awarded in further maths at 29.9%. 17.2% of maths candidates achieved the grade. The numbers taking maths continued to rise with an extra 4,526 entries, and an extra 1,209 for further maths. It is pleasing to see this trend after a marked fall back earlier in the decade. In Scotland, the overall pass rate for Highers was up slightly, to 74.6%, creating a new record. Northern Ireland fared the best of the regions, with 35.7% of papers being given an A or A*, 9.3% the A*. So why, despite these record successes, are many candidates facing disappointment over university places? Applications this year are up by 12% on last year's record level, with the numbers increased by those re-applying after not finding a place last year. Many universities are warning that the number of places available through the ‘Clearing System’ will be severely restricted. Last year almost 48,000 students found places through this system, which matches available university places to students who did not get the grades they needed for their first choices. Half of Scotland's universities have already said their courses are full. Universities Minister David Willetts congratulated students on their results and said that those who did not get the offer of a university place had other good options. "There are more university places than ever before and already 380,000 applicants have got confirmed places at university. For those who have sadly not done as well they hoped, there are places available in clearing. "Of course, university is not the only route into well-paid and fulfilling work. That is why we are also investing so much in Further Education and 50,000 extra high-quality apprenticeships." Some may accuse Willetts of having his head in the sand. We have heard stories of students with three A* grades without any offers of a university place. The president of the National Union of Students (NUS) Aaron Porter said: "With youth unemployment pushing one million, savage education funding cuts and arbitrary limits on places, the government is at risk of imposing poverty of opportunity on a generation of young people facing a very uncertain future." The biggest problem this year is clearly the recession. With jobs scarcer, the competition for university places automatically heats up. But there are other factors at work too. The system has become skewed by awarding points for A-Level grades, implying that an A-Level in media studies is as valuable or useful as the same grade in maths or a science. The fact that these softer subjects are attracting more teachers only exacerbates the trend. The private sector and the best state schools have shown that it is possible to maintain good standards, while keeping the demand for trendy or less demanding subjects to a low level. Securing a place for your child at one of these schools and the rules for the child’s education are clear: traditional subject choices, respected by the top universities, rigorously pursued. It is a recipe that has sadly disappeared in too many places. Our school-leavers deserve better than the mess they have found themselves in this year. What will become of our goals of greater social mobility when subjects such as German and physics thrive in the independent sector but are dwindling elsewhere? The knock-on effect is the closure of the university departments in these subject areas, and this has already begun. If you are still unsure about where or whether to go to university, it’s essential to get some high-quality, targeted information, advice and guidance. Speak to your teachers and to the universities themselves. Don’t rush into a course that isn’t suitable for you. You may end up leaving university early without a degree, but with the debt. So the long wait is over. A-Level results are out. Congratulations if you have achieved your goals. And good luck if you are still waiting to hear about your post-A-Level destiny. Two over-riding themes emerge from this year’s bunch of results: the ever-improving grades achieved (including the awarding of the new A* grade this year) and the shortage of university places available for this year’s cohort, both of which are cited as evidence of at best a sign of desperate times, at worst a failed education system. What of the first, the notion commonly referred to as ‘Grade Inflation’? (I’ll look at university places in my next post). First, the statistics. Well, it was another record-breaking year of results. One in 12 A-level exams (8%) has been awarded the new A* grade (which, we believe is given to those who gain roughly 90% in their exams). 27% of entries have gained an A or A* grade and this rate is currently increasing at about 1% each year (26% achieved grade A last year, 25% the year before). The overall pass rate rose for the 28th year in a row, with 97.6% of entries gaining an E or above, up from 97.5% in 2009. In my mind, a number of issues are at play here. Firstly, let’s give some credit to the students. They are working harder, becoming more organised and better mentally equipped. They support each other, get help from parents and sometimes personal tutors. The web and great textbooks also help. Secondly, don’t forget the teachers. Teaching methods are improving and this is assisted by new developments in the classroom, such as interactive whiteboards, a whole host of educational websites, and considerable expertise in these resources, as well as in the subject matter. Well done teachers. There has also been some talk, particularly in these competitive times, of pupils choosing ‘softer’ subjects, in which they are more likely to rack up the number of A-Level points to move on to their institution of choice. But I don’t think this is the end of the story. As I’ve hinted already, there’s fierce competition out there. Pupils are realising that it’s a battle out there, and the best university places, or the best jobs, come from good grades. They see the incentives and they are prepared to work to get the rewards. But I’m going to highlight one more factor, which I haven’t heard mentioned in the debate so far. I have done a lot of work for the exam boards over the years. Edexcel’s mathematics A-Level provides good, challenging questions, in about 12 different maths modules. The questions are quality-controlled, the examiners are tested, their work is scrutinised. In turn, the examiners’ supervisors are put through a rigorous qualification and testing procedure. The planning and the chain of command are almost militaristic. 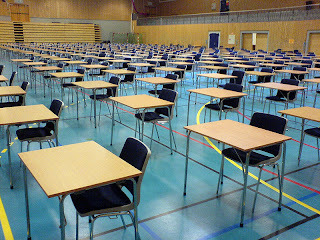 But – and here’s the point – the exam papers are not necessarily too easy, they are too samey. Year after year, the question papers feature questions from the same topics, with only the numbers changing, the ordering of the parts or the words changed to alter the subject of the question. There is no imagination required to solve some of this stuff. Learn the technique and you know how to pass the exam. The teachers know this and a thorough analysis of the last 5 years’ past papers give them all the teaching material they need to ensure a good bunch of grades from their class. It’s only exams like Cambridge University's STEP papers and the Advanced Extension Award that really test the imagination, the inventiveness of our pupils. In my mind, this is the way forward. Forget A* grades, A** grades, ad infinitum. Let’s change the exams. Edexcel and the other exam boards should put as much effort into devising a truly challenging set of exam papers each year as they do into ensuring a fair and unbiased system (which is, of course, also very important). Perhaps a little adjusting of the syllabus would be necessary. The truly outstanding pupils would shine. An A grade at A-Level would be a true indication of excellence, one that would make us proud of the UK’s education system again. The Conservative-led coalition government came to power in May and set about reforming every area of public life with what some would describe as indecent haste. Michael Gove is our new education secretary and instantly went into negative territory on the credibility meter with his bungling of the announcements about schools that will undergo refurbishment work. This programme, of course, is being cut back, like everything else, but Gove's handling of the lists of schools made him look likely to be the second casualty of the already embattled new cabinet. As I write, however, he is still in office. His latest pronouncements relate to the A-Level and, almost parodying his own party, he wants to take things back to some Golden Age he half-remembers, when the A-Level exam was indeed a single exam at the end of two years of study. He says he wants to "revive the art of deep thought". If his plans come to fruition, it would mark the end of the AS exams, which students take after their first year of A-Level study. In a response to his comments this week, the Advisory Committee on Mathematics Education (ACME) said harder exams could put students off studying A-Level mathematics and that this could trigger a "collapse" in A-Level maths student numbers and even lead to university department closures. Professor Dame Julia Higgins, chair of ACME, warned making A-level maths harder could result in a drop in the number of students taking the subject. She said: "We feel it is very important that we warn you that implementing such a policy runs a genuine risk of repeating the collapse in the numbers studying A-level mathematics". She went on to say it was very likely that university mathematics departments would close as a result. A-Level maths has been in a modular format since the introduction of Curriculum 2000 at the turn of the millennium. Student numbers fell by about 19% over the following 3 years. There was an overhaul in 2004 to make the A-Level more accessible, and the old "Pure" modules were replaced by the current "Core" modules. After 6 more years, student numbers are now more or less back to where they were before modularisation. Michael Gove said universities had complained A-levels were not preparing students sufficiently well and that he wanted them to be more academically rigorous. Modular A-levels have been criticised as being easier than the traditional variety, because the learning is broken up into many small units. Critics argue that the process of modularisation has contributed to grade inflation, where the percentage of pupils getting a grade A has continued to rise year-on-year. This year, the A* grade will be used for the first time to reward those achieving the very best results. Cambridge University's STEP papers and the Advanced Extension Award have also been used to differentiate pupils with top grades. But Cambridge University have joined with ACME in criticising Gove's remarks. Cambridge admissions manager Geoff Parks said AS-levels are an "invaluable indicator of progress". He added: "We agree with the secretary of state in some aspects of the reform. We would agree that at the moment A-levels are too modular and there is too much examination. We are not sure all the opportunities for re-takes are advantageous. But we think there is a middle way between where we are now and the proposals he has set out." The Department for Education said there was a need to restore confidence in public exams. It said it would work with universities for a "robust and rigorous" A-Level and that reform plans would be set out later in the year.